A fresh, new notebook almost always causes me to stop and think. It is an amazing symbol of unlimited possibilities, acres of pristine pages just waiting to hold my thoughts, ideas and sketches. 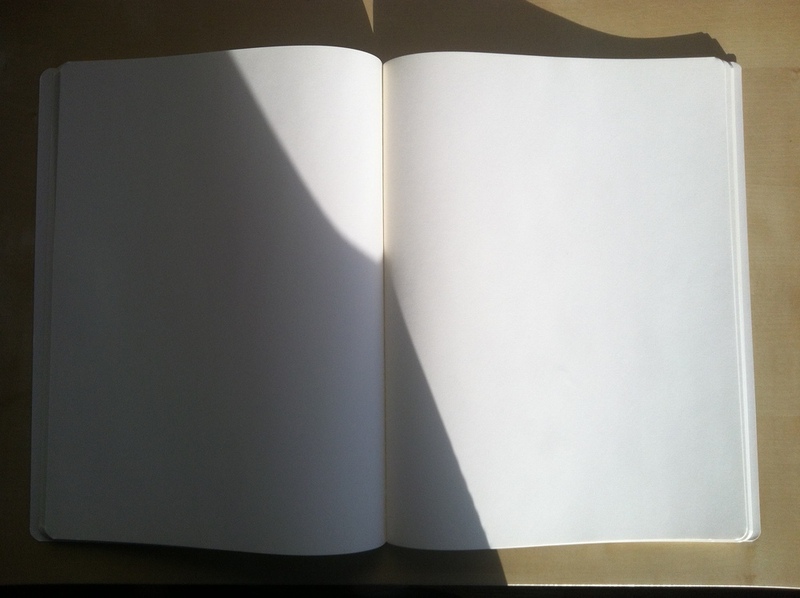 At the same time it terrorizes and taunts me with page after page of 'the blank page.' The inner demon, the lizard brain, stirs into action. And so on. The lizard brain also stirs up middle-manager mode: the part of me that thinks that organizing things counts as getting work done, the part that thinks I'm helping myself be more efficient with my time in the future. Middle-manager mode desires the notebook to have a particular purpose, to plan the arc of the whole notebook and use it for only one thing. If I listened to middle-manager mode, I'd have notebooks for drawings, sculpture ideas, education thoughts, reading lists, goals, photography ideas, music to listen to, music to record (of course broken up into guitar based songs and electronic based songs), recipes, workout stuff.... and so on, ad infinitum. Whenever I come up with an idea, I'd have to first figure out how to categorize it and where it belongs before recording it. By that time, I'll likely have forgotten the idea. And that's exactly what the lizard brain wants. So I've been fighting back, recognizing the need to push beyond the bureaucratic part of my brain and just start using the notebook. For anything. So far in this particular notebook I've outlined projects, sketched a plan for kitchen organization, jotted down random ideas, journaled every day for a month and sketched designs for some tables and sculptures among other things. It has become primarily a journal, but that developed organically. Taking away the 'rules' of the notebook has allowed ideas and thoughts to flow more freely. I have adapted this approach in other places as well. On my computer, I use Evernote to keep notes and work on projects with friends. I used to have a pretty serious folder set up, with a folder for almost every category imaginable. Recently, I decided to do away with structure and mimc Steven Johnson by having a 'Spark' folder where pretty much everything and anything goes. The only requirement with this approach is that you periodically go through the folder and review the entries. I do this in the real world as well, with a box where I put the thoughts I've written on post-it notes, notecards, scraps of paper, napkins etc. My mind doesn't come up with ideas already pre-packaged in a specific category, they're all over the place. An open collection system means anything goes. I can always organize things later. The same is true with the blank notebook. Maybe the notebook takes on a purpose of its own after a few pages or maybe it just turns into an awesome compilation of random things. In the end, I think it's important to see the blank notebook as a raft that can help you 'go with the flow' and float down the river rather than an anchor that keeps you in one, predefined place.